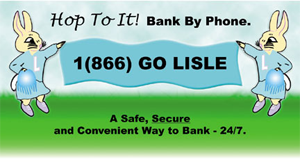 With Lisle Savings Bank’s EZ Bank Telephone System, all you need is a touch tone phone and your personal ID number and you’re ready to transfer funds, check your balance, make a loan payment and more. Take it from Bunny and Munny. You don’t have to hop all over town to do your banking. Please contact us at (630) 852-3710 for details today!